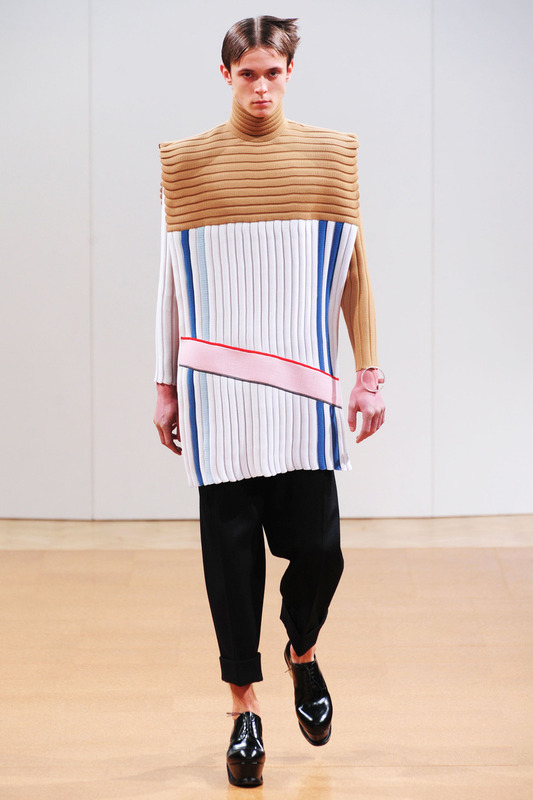 London Men’s Fashion Week – cutting edge style! For anyone who is into fashion, just like me, I love the chance to follow the different season showings around the world and to follow the shows as they kriss cross the globe. 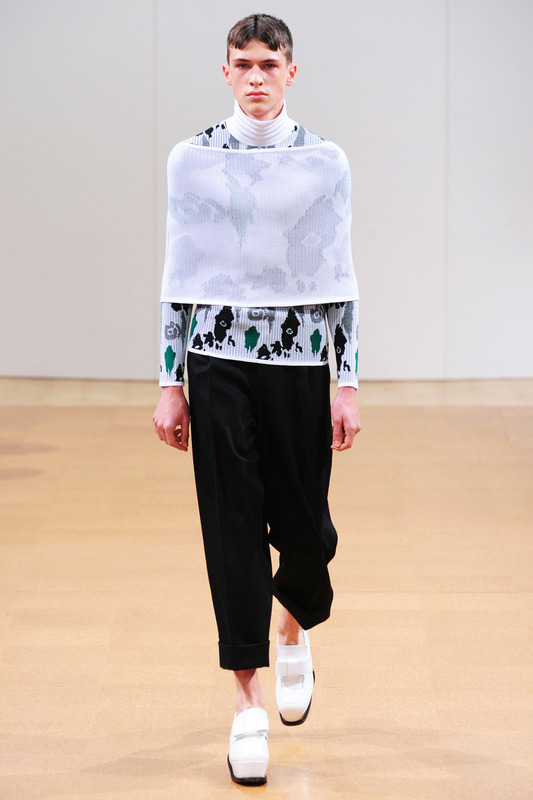 It is interesting that at this time of year, and so early in the new year, that London Men’s Fashion Week is held. It is a tough time to get the buyers, editors and even the bloggers along as many are still away on festive breaks but onwards it goes with it concluding tomorrow in London (they are a few hours behind us here in Perth after all). I have not been able to yet see all the collections but 2 of those that I have seen that I really loved were the collections by Alexander McQueen and J.W. Anderson. 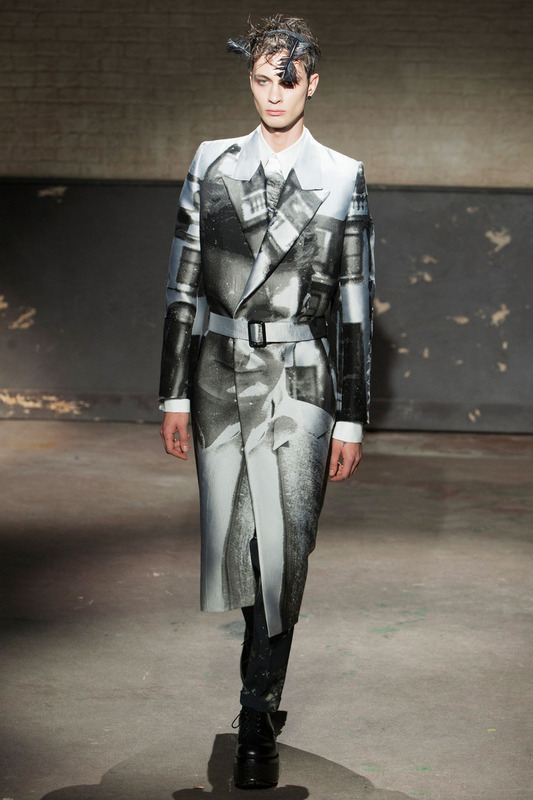 The Alexander McQueen show was held in a dilapidated Welsh Chapel on Charing Cross Road. Those who attended were ushered into this crumbling structure of peeling paint, dirty stained glass windows and marble columns to be seated on folding chairs. The range however did not disappoint and for an autumn collection it consisted mainly of a colour palette of black and grey, with the occasional glimpse of gold. 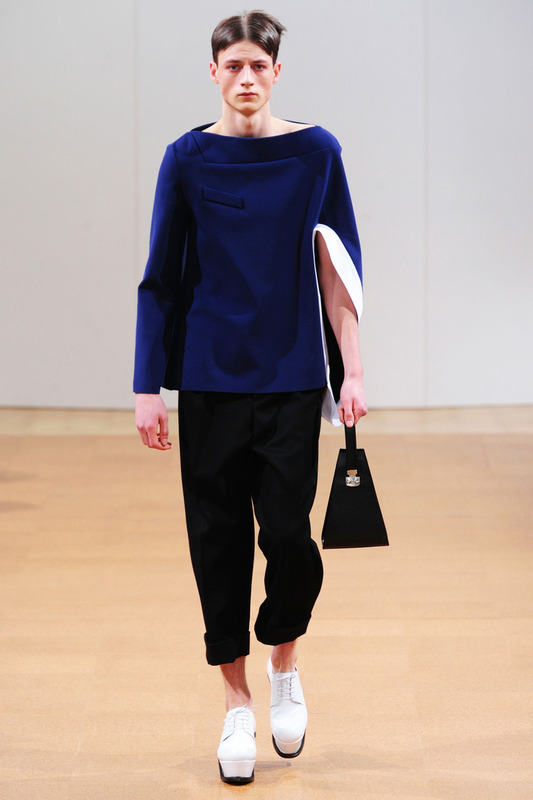 One of the consistent trends among a few of the designers this week has been the use of platform shoes for men. I am not sure how I feel about this retrograde step back to the 70’s and as someone who is already 188cm tall I don’t think I necessarily want to add another few inches and consider twisting an ankle as I make my way around the streets, work or an event! 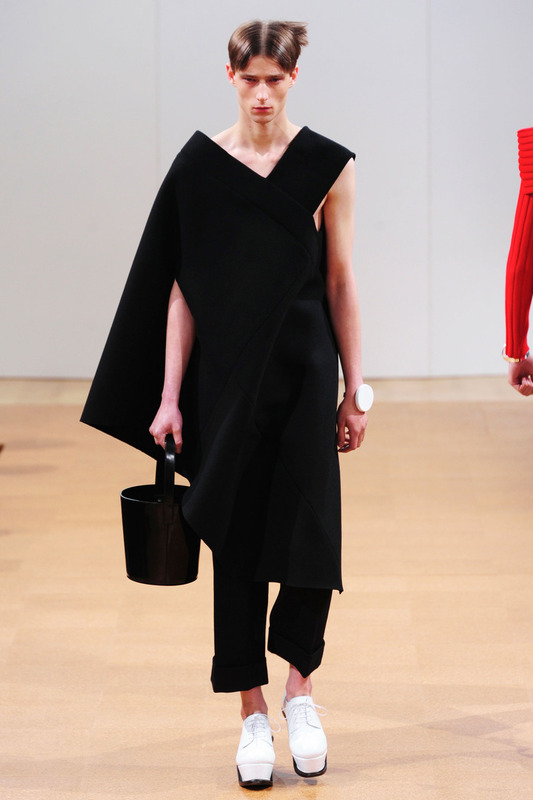 So we shall see if this catwalk trend makes its way to our shores later this year. The McQueen collection also included large stitch knits that looked almost hand knitted that were really loose and quite chunky. To go with this very subdued palette the models all wore black feathered head dresses to complete their looks. 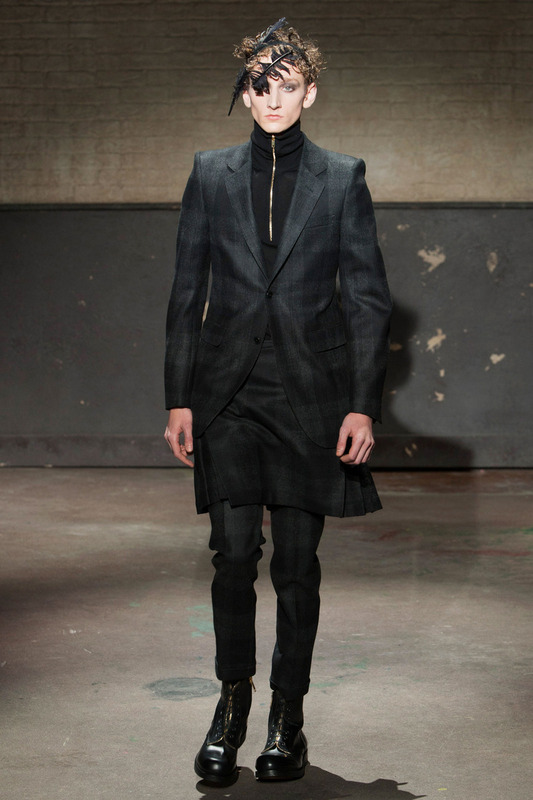 There was also the inclusion of kilts over tailored suit pants to add another dimension and I have to say what I saw of the collection really appealed to me. Some of the clothing would of course be hard to wear here in Perth as I am not sure if our weather would really suit some of the heavier fabrics but the styling, patterning on the suits and some of the jumpers was outstanding. Looks from the Alexander McQueen Autumn Collection! The J.W. 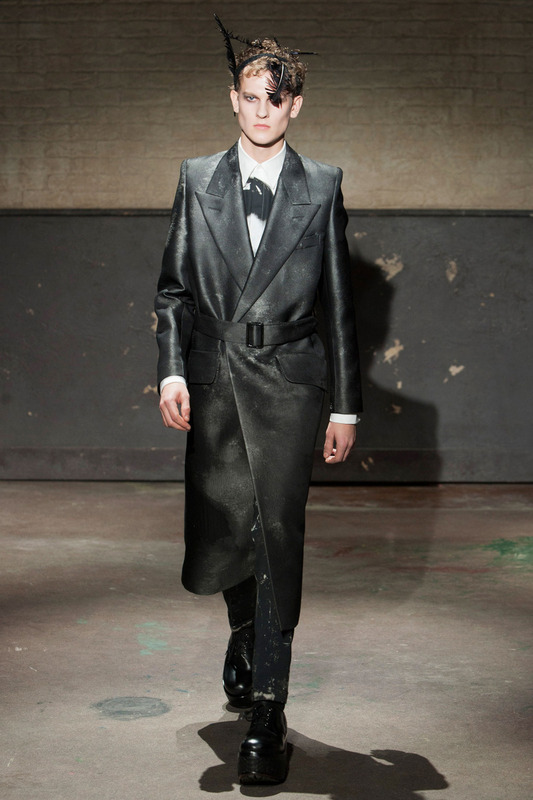 Anderson collection by comparison followed on from the usual androgynous, gender blurring take on men’s fashion that has been shown by the label over the past couple of seasons and did not disappoint. For this collection, there were cropped black trousers, sleeveless, collared blouses, glittering slim-cut shirts with padded shoulders, and stacks of bangles around wrists. 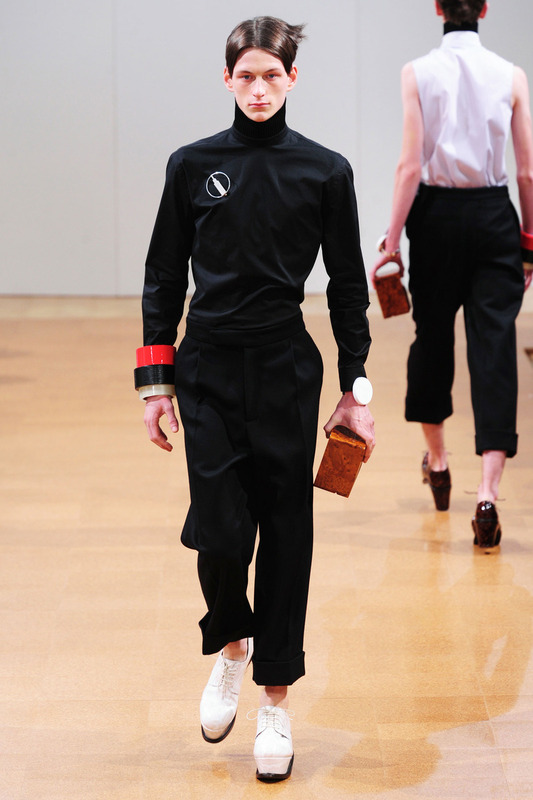 The bags designed for this collection came in the form of black-leather buckets and wooden box clutches, but the thing that was the stand out and was the talk of the show were the patent-leather platform clogs and loafers adorned with bows. 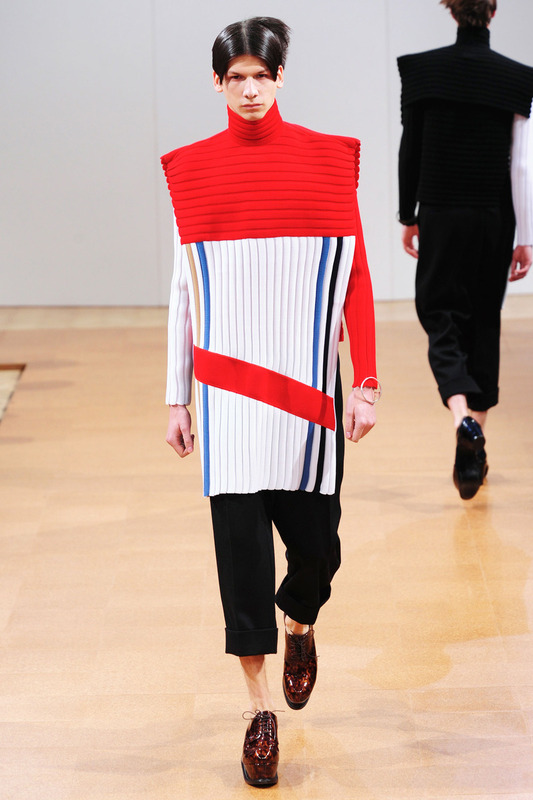 There was also much more use of colour across the range and knits featured as well. As per my statement above I am not sure if these will take off or in fact make it to our shores but I will be keen to see how it evolves into an Australian aesthetic, if at all. J.W. Anderson is always pushing the boundaries! 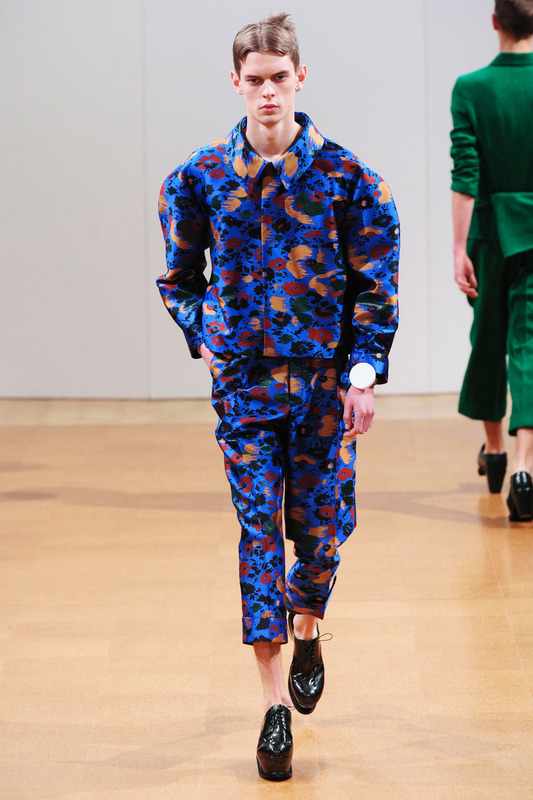 As you would know if you follow my blog, that I love clothing that blurs the boundaries of gender and clothing that flows, looks comfortable to wear, is really different and experimental in its use of shapes, colours, cuts and look and J.W Anderson does not disappoint on this level. So here you have 2 of my favourites from this 3 day Men’s Fashion Week in London. What do you think? Are their pieces here that you would wear? I know if I could get my hands on some of the pieces I certainly would give them a go, but certainly not the platforms. 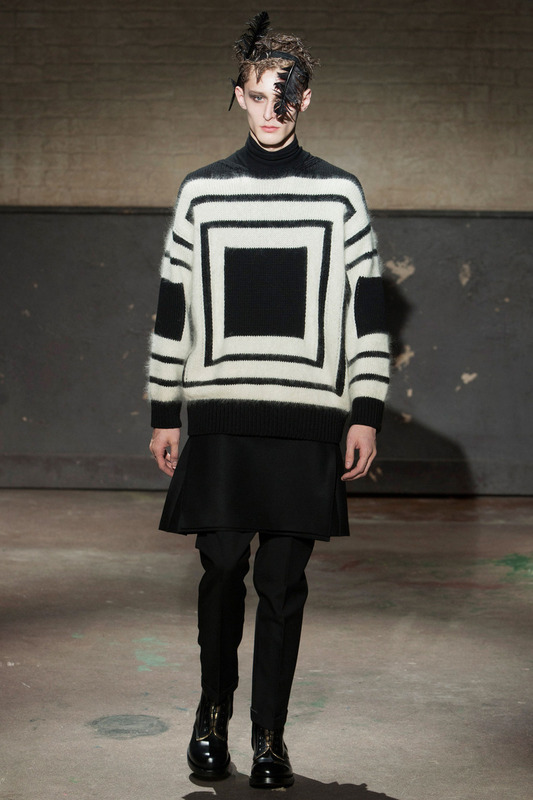 Fashion trends in 2014 what lies ahead? 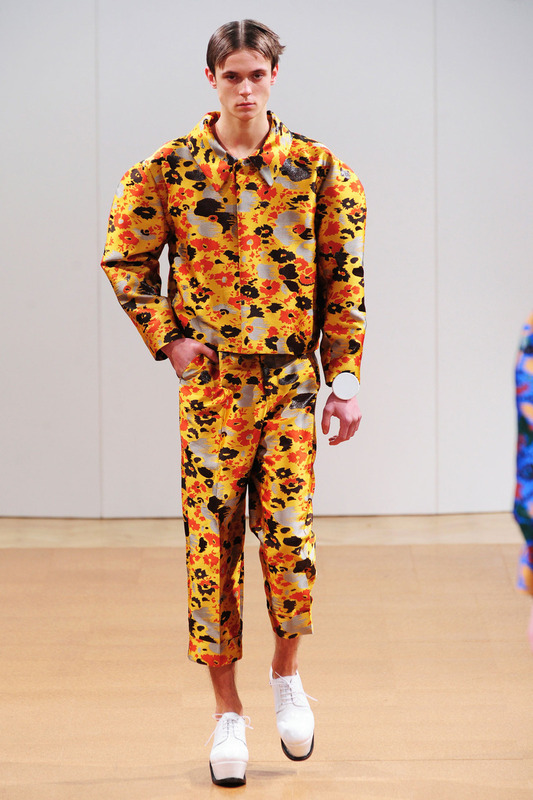 London Men’s Fashion Week take 2 – eclectic designs trumps every time!